"We are here at Union Station as scheduled! We are on North Capitol St and Massachusetts Ave NW in front of @PostalMuseum! See you soon!" Nothing beats a nice huge cup of Pho on a cold, drizzly DC day right before a big eating holiday...it's like a chicken soup cleanse from SE Asia. First of all, the customer service from this truck is great. As a newcomer to this truck, I found that sometimes their location information is not quite accurate, but enough to find them after a quick search or knowledge of where they usually hang out. As for the food, I ordered steak pho. The prices no longer include tax (menu pic still shows that they do), so the total was around $11. The flavor was good. There was a decent amount of meat I think. It got me over my craving for pho that day. However, it is way overpriced for what you get, especially when contrasted against my favorite restaurant which serves a large bowl of broth only (same size container as Pho Junkies) plus the noodles and meat and herbs for $9.50, tax included. Except the container from the truck already contains the noodles/meat/few measly herbs so the amount is far less. Aug 20, 2014 by Amanda H.
The pho was fantastic. 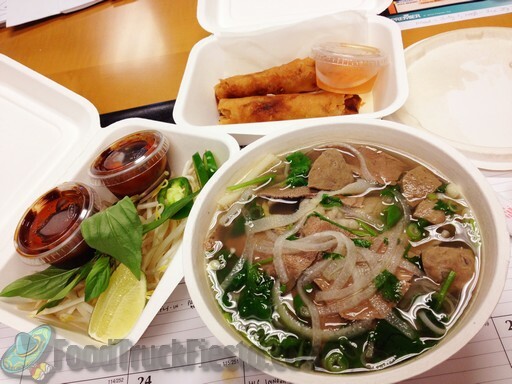 Broth had a great flavor, and it wasn't greasy like the other pho trucks. Generous helpings of meat and noodles. And, the customer service was beyond fantastic. Super nice, and treats regular customers like they are VIPs. One of the best food trucks DC has. The namesake dish is Pho-nomenal, if you will. Go right now, you won't regret it. This is the best pho truck DC has to offer. They haven't been close to my office in the last several months, but I have walked to find them because they are just THAT good. They are generous with the meat portions and the flavor is delicious. The service is great, too. This is the absolutely best pho, ever. The broth is rich with seasoning, the serving size is perfect for lunch, the meats are sliced perfectly, plus the additions of fresh basil, lime/lemon, jalapenos and sauces. I highly recommend this wonderful food and two of the best people who make each individual feel like family. Still one of my favorite trucks out there, and by far the best pho truck in the D.C. area. The are consistent with quality and flavor of their broth, the meats are tender and the noodles are cooked perfectly (never mushy or gummy). We are lucky that they are not complying with the "lottery" system and continue to come to L'Enfant consistently every Wed even tho they have to park a certain distance away from the other trucks. The pho was excellent. Very flavorful broth, plenty of meat and herbs such as basil and cilantro. Everything stayed warm and fresh on the walk back to my office. The spring rolls were OK -- not as good as you would get in a restaurant but acceptable for a food truck. I will definitely be back. Delicious! Broth was really flavorful, and still piping hot when I got it back to the office. Noodles were a good texture, not mushy. Plenty of toppings. And the chicken was well-trimmed - just meat, no fat or gristle. Perfect comfort food on chilly day. This is by far the best pho that I have consummed. I visit this truck at least once a week. Get their early though if you don't have the patience to wait in the long line. But, it is (oh so) worth the wait!! Customer service is excellent. Give it a try if you have not yet. Thank you Pho Junkies for your kindness and consistency in exceeding my expectations with the best chicken pho around!! 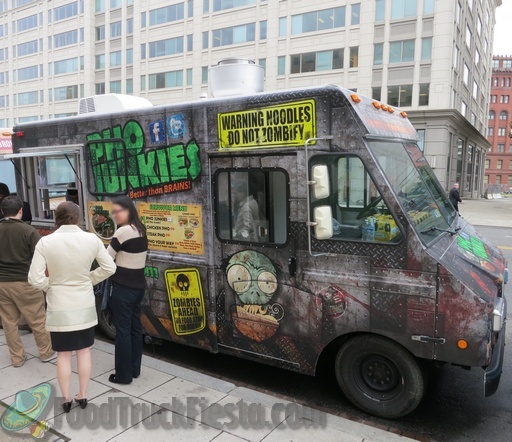 Pho Junkies food truck launched on May 1, 2012. Their truck wrap is one of the more stunning pieces of artwork, playing on the zombie apocalypse theme – fun! Thanks to Seth for providing the photos! 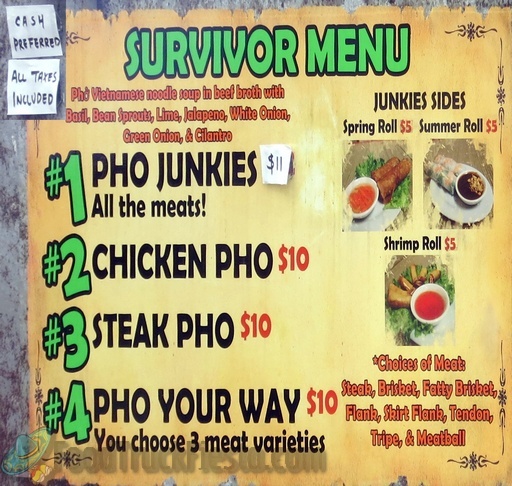 The menu is pho (loaded, steak or you select three meats), or chicken. They also have spring rolls, shrimp rolls and summer rolls.